You Want to Get Better Mixes Right Now? READ ON!!! This week I want to tell you the secrete to achieving a great mix. There are two things you need to master or at least be extremely good at to ensure you can produce a great mix every time. Actually there are three things but you may only have control over two of them as the mixing engineer. What are they you ask? A great recording! This is obvious right? Well, I think we all forget this concept more times than not. You hear the phrase all the time “get it right at the source”. Meaning that if you have great-recoded tracks you have a great foundation to work from and it makes the mixing process much easier. So if you are the one who is recording the artist then work on your recording chops. Learn about mic choice, mic placement, recording levels etc. Take great care to achieving a great recording and you will thank me later! If the raw tracks sound great then you are on your way to a great mix! The next two things are the first two plugins you need to master and really the only ones to be completely honest. You get these down and you will turning out great mixes trust me.
. If you have a good handle on how to effectively apply EQ and Compression in a mix then all the rest of the fancy reverbs, delays, transient designers etc. are just icing on the cake. I recommend that you use you stock plugins for this and don’t worry about 3rd party plugins. It’s not the price of the plugin that matters it’s how you use it. 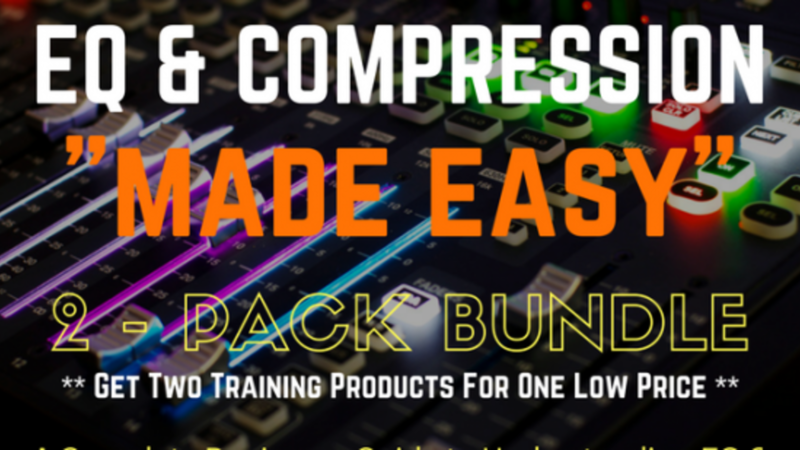 It really surprises me that out of all the MADE EASY SEREIS products I have to offer EQ MADE EASY & Compression MADE EASY are the two lowest selling products by far. They are the most important and the ones that everyone should start with but they are not the titles that people choose first. Why? I think it’s because people want to jump right to the MIXING MADE EASY products and just copy what I am doing with EQ and Compression and not take the time to really get these two concepts under their belt. It’s like sort of cheating on a test in school. You just want the answer but don’t want to take the time to learn how I got to the answer. Shame, Shame…..LOL. If you do not own both of these then I highly recommend that you get them and watch them several times until you really understand how to effectively use them. Trust me when I say that you will be so glad you did and your mixes WILL sound more professional.